Accessing email through a POP3 or IMAP account lets you have greater control over how you interact with your email. Set up how frequently your mobile device syncs with the email server, how email is handled after it has been delivered to your device, and more. POP3 is the simplest to set up, but IMAP may offer more customization options. 2. Enter your Email address and Password, and touch Next. 3. Your device will attempt to complete the setup process if your email server settings are available. If you select Manual setup or your provider’s settings are not loaded, you will be taken through the following steps. 4. Select the type of email account you are setting up. You may choose POP3 account, IMAP account, or Microsoft® Exchange ActiveSync®. We’ll walk you through setting up a POP3 account. 5. Enter your incoming server settings. This should include your Username, Password, POP3 server, Security type, Port number, and Delete email from server preference. Then touch Next. 6. Your device will attempt to connect to the incoming server with the settings you have entered. If unsuccessful, you will be prompted to Edit details. Confirm your settings and try again. If the connection is successful, you will be taken to the Outgoing server settings screen. Enter your outgoing server settings, which should include your SMTP server, Security type, Port number, Require sign-in preference, Username, and Password. Then touch Next. 7. Your device will attempt to connect to the outgoing server with the settings you have entered. If unsuccessful, you will be prompted to Edit details. Confirm your settings and try again. If the connection is successful, you will be taken to the Account options screen. You can adjust these and more sync settings later in your account settings. Touch Next when you have finished making your selections. 8. You will be asked to give this email account an on-screen name. The unique account name is used to differentiate this account from other email accounts on your mobile device. Enter Your name as you would like it to be displayed on outgoing messages. Touch Done to complete the setup process. From the Home screen, touch Apps > Email > Menu > Settings. 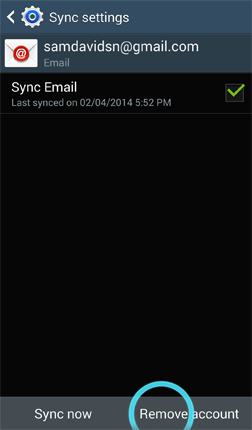 Sync Email: Keep your email in sync. Set sync schedule: Select how often your device should check for new messages. If you have Peak schedule (below) turned on, this sync schedule will apply outside of the peak schedule you set. While roaming: Select how your device should behave when you are roaming outside your wireless service provider’s network. Peak schedule: Set a different schedule for syncing email during a set period of time, such as during work hours. Set peak schedule: Select how often your device should check for new messages during the peak schedule. Peak days: Select the days of the week that are part of the peak schedule. Peak start time: Set the peak start time. Peak end time: Set the peak end time. Size to retrieve emails: Set an email size limit. Your device will download only the headers for emails that exceed this limit. When you open the message, you will be able to download the entire message. While roaming: Select the email size your device should download when you are roaming outside your wireless service provider’s network. 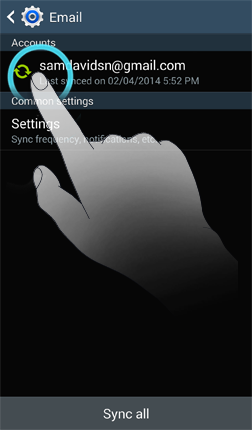 Signature: Touch the slider to turn Signature on . Your device will add the signature to all outgoing messages for this account. Touch Signatureto edit the signature that will be sent. Default account: Set this account as the default used for outgoing emails. Email notifications: Display notifications in the status bar when this account receives messages. Select ringtone: Assign a notification sound to play when this account receives messages. Vibrate: Set your device to vibrate when this account receives new messages. Account name: Edit the account display name. Your name: Edit the name shown in the From field of your outgoing emails. Always Cc/Bcc myself: Include your email address in either the Cc or Bcc recipient field. Show images: Show all pictures when you are viewing emails. Security options: Set the encryption options for sending emails. Number of emails to load: Select the number of recent messages your device should download. Auto resend times: Select the number of times your device should try to resend a message after the first attempt fails. Incoming settings: Adjust the incoming email server details. Outgoing settings: Adjust the outgoing email server details. Auto fit content: Adjust messages to fit the screen. You can zoom in and out of the message after it opens. Message preview line: Select the number of lines the Email application should show when previewing a message. Title line in list: Select the title the Email application will show in the message list. Choose Subject or Sender. Quick responses: Edit the quick responses you can use when creating or responding to emails. Default image size: Set the default size of pictures received in messages. Choose Original, Large (70%), Medium (30%), Small (10%), or Always ask. Delay email sending: Set your device to delay email sending. This lets you cancel a send request if you accidentally touch send or want to change an email after sending it. Touch Delay email sending and mark the Delay email sending checkbox. Then touch Set length of delay and choose a delay of3 seconds up to 30 seconds. Auto advance: Choose how the Email application should behave after you delete a message. You can have the application go to the Next email, Previous email, or Email list. Confirm deletions: Have your device confirm your desire to delete a message. Priority senders: Manage contacts added to the priority sender list. Set as the default folder: Show the priority sender inbox when you open the Email application. Email notifications: Display notifications in the status bar when priority sender messages are received. Select ringtone: Assign a notification sound to play when priority sender messages are received. Vibrate: Set your device to vibrate when priority sender messages are received. Spam addresses: Edit the list of senders and domains that you have tagged as sending spam messages. Rules for filtering: Set filters and manage filtered email when using the combined inbox view. Split view mode: Turn on split view mode when holding your device in landscape orientation. From the Home screen, touch Apps > Email > Menu > Settings > Add account. From the Home screen, touch Menu > Settings > General > Accounts > Email and touch your account name. 3. 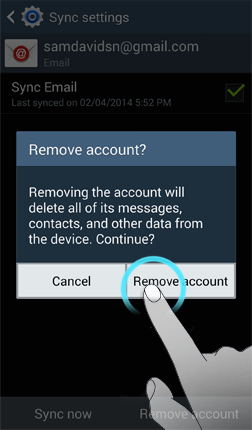 Confirm you want to remove this account from your device by touching Remove account.